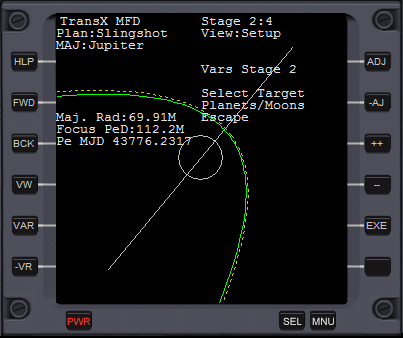 TransX is a navigation MFD for Dr. Martin Schweiger's Orbiter Space Simulation, allowing the planned multistage trajectories for transfer orbits two other planets and slingshot trajectories. TransX was initially developed by Duncan Sharpe up to version 3.10. Version 3.10 is included in the default orbiter installation. 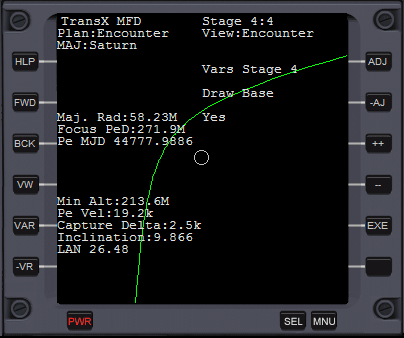 Launch Compass is a small utility I made so that you can roll craft like the shuttle the correct amount before performing your pitch manoeuvre. This is a really good two page quick reference guide to TransX created by Francis Drake. (well, that's his Orbiter moniker anyway). Duncan Sharpe's excellent deep space manual can also be downloaded here. Flytandem also has an excellent selection of TransX tutorials. 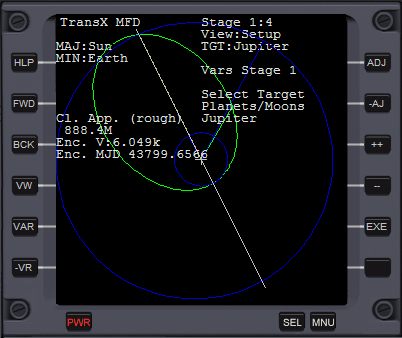 The latest version of TransX (3.13) Can be found on Orbit Hangar. Older versions and beta releases can be found here. Please PM me (agentgonzo) on the Orbiter Forums with bug reports/suggestions. Orbits now calculated based on the barycentre of planetary systems - no more Earth-Moon wobble!